By daytime in World War II, Charlie Mason was an aircraft engineer at Brough, but this just provided cover for his covert membership of Britain’s secret resistance organisation. Charlie’s role, in an invasion by foreign enemy troops, would be to fight the invaders from behind their own lines with a campaign of espionage, sabotage and disruption. Charles Arthur Mason was a member of the South Cave Patrol of the secretive Auxiliary Units set up on the orders of Prime Minister Winston Churchill in 1940. This secret army was established with two key roles during an invasion by forces of Nazi Germany; to collect intelligence on invading enemy forces and to organise a guerilla offensive behind enemy lines. Nominally part of the Home Guard, this was certainly no ‘Dad’s Army’. 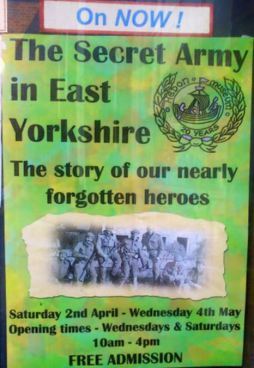 An exhibition at Hedon Museum, which opened on Saturday, reveals much about the secret life of Charlie Mason who along with his comrades trained and prepared to resist the invaders. 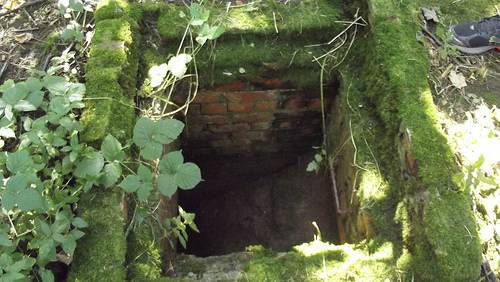 Because of the secret nature of its organisation, the story of this ‘underground’ resistance army remains largely untold, and for most of his life Charlie, bound by the Official Secrets Act, kept his wartime role secret. Jo Mulhearn with display boards about her father Charles Mason. 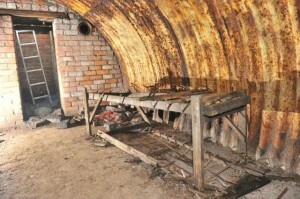 During an invasion, Charlie would have made his way to his operational base, a hide-out in the countryside stocked with knives, guns and explosives from which his unit would conduct operations against the enemy. Some of those items, safely decommissioned, are on display in the exhibition. 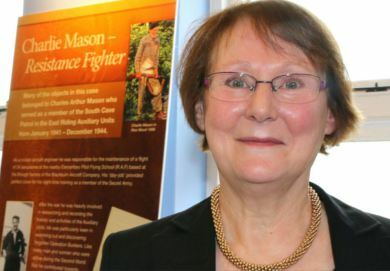 Maggie Sumner from the Hedon & District Local History Society was particularly interested in one commando knife in the exhibition which she believes was the one that Charlie brought with him when he gave a talk to a meeting of the Society, perhaps 20 years ago. “The presentation stands out, even after all this time because of the interesting subject matter, but also because of Charlie holding this big lethal looking dagger!” Apparently, in peacetime, the knife was used for nothing sinister but merely as a gardening trowel by Charlie! Alan Williamson, author and researcher, and Jo Mulhearn. There was a real threat of invasion in the early part of the war, and whilst that did not take place, the Auxilary Units were kept in active service until finally ‘stood down’ in November 1944. 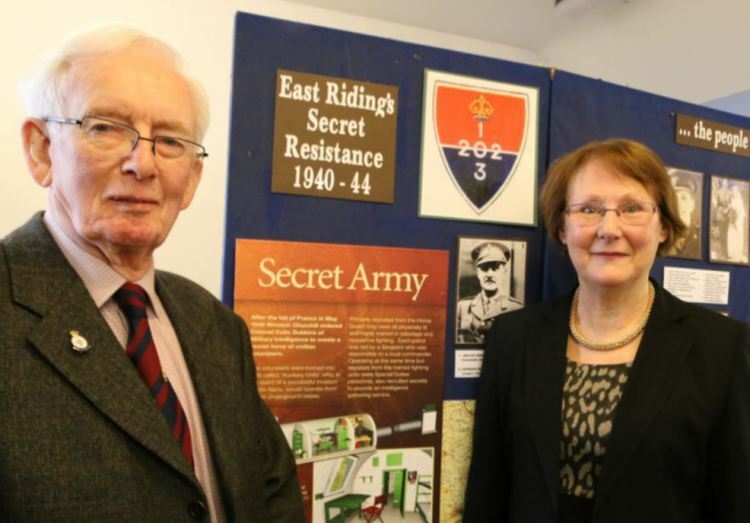 The “Secret No More” exhibition currently showing at the Hedon Museum reveals much about the membership and wartime activities of this secret army and draws heavily upon the experiences of Charles Mason (1914 – 2008) and other veterans of this most secret army. 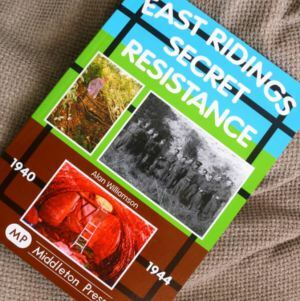 The story of East Riding’s secret resistance army 1940-44 at Hedon Museum is open every Wednesday and Saturday, 10 am – 4 pm until Wednesday 4th May 2016. Refreshments are available. Please seek out the signs and notices in Hedon town centre to find your way to the museum which is behind the town hall complex. Today we have added a page including pictures and video on the Beverley South Auxiliary Unit Patrol from East Ridings in Yorkshire. Rise Operational Base – Could this be the longest OB in the UK? Andy Gwynee, our CIO for Yorkshire has visited the huge Rise Operational Base. This OB was used as the Yorkshire HQ for some time before it moved to Middleton-on-the-Wolds. It was somewhat custom built by the plans made from Captain Peter Hollis who was the Commanding Officer / Intelligence Officer for East Riding. Being the HQ OB this dictated its size so it would accommodate extra supplies for other Patrols and could accommodate other Patrol members who’s own Patrol OB had been destroyed or discovered.